Sometimes it's not so much the ingredients that matter, but rather the price of the bag, and even at the basic end of the dog food market there's a lot of difference in the price you can pay. Here's a very good example. 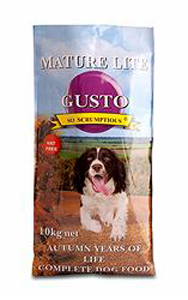 Gusto would not claim to be top of the range all natural dog food free of of derivatives, but it does contain more of a named meat source than many basic foods and it is naturally preserved with tocopherols like many premium foods. 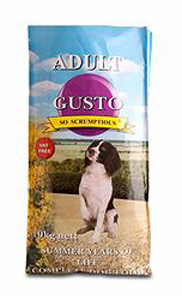 Gusto is sold as a working dog food, a little legal loophole that enables them to sell without adding VAT, and this obviously keeps the cost down. This is a very basic food, offering the basic nutritional requirements at a very economical price, particularly if you compare it with other foods that are more expensively marketed and pretend to be something other than very basic. But you are getting animal derivatives, preservatives, un-named cereals etc - so don't compare prices too much with the better quality premium foods! 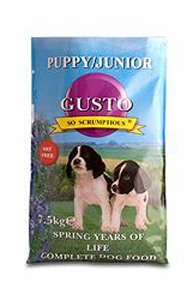 Check out the prices of basic foods and you'll see that this is a good value basic dog food. Yes, you'll find yourself feeding more than a premium, and you'll be picking up more poo, but if price is a real consideration, then this is worth trying at under £9 for 10kg! Cereals, Meat and Animal Derivatives (min 4% beef and 4% lamb), Vegetables (min 4%), Oils and Fats, with EC permitted antioxidants: mixed tocopherols, vitamin C and rosemary extract. Cereals, Meat and Animal Derivatives (min 14% beef and 4% lamb), Oils and Fats, Vegetables (min 4%), with EC permitted antioxidants: mixed tocopherols, vitamin C and rosemary extract.